I believe that our generation will be the most well-documented generation of all time. Everywhere you go, you see people with cell phones taking pictures. People take pictures of everything, not to mention video. It’s amazing how everyone now aspires to being a movie star. It’s not bad to be self-conscious. Like it or not, you will be in somebody’s photo whether you want to be or not. It’s just dumb how people indiscriminately take photos of everything. There’s very little that is secret nowadays with cameras and video. If you would like to see inside the Vatican or you would like to see inside somebody’s garage, you could probably find a way. Signs that say no video photography or no camera photography are ignored. From movie theaters, to the live theaters on Broadway, to the great concert halls around the world, people in charge have a hard time preventing audience members or others from taking photos or video. The paper trail is getting smaller. They have stopped automatically giving paper receipts at the liquor store or at the grocery store in my town. Everything is going electronic, at least that’s the way it seems nowadays. Even plastic, aka credit cards instead of currency is becoming more common. I saw someone pull out his checkbook this morning and I thought, Dark Ages! LOL! Well my husband got me hooked on George Formby. You may not know who he is if you are not familiar with the British musicals that George starred in during the nineteen thirties and forties. His father, George Formby, Sr. was also a popular and successful musician and entertainer. As a result of dad’s success, George Jr grew up in a life of opulence that belied his Blackpoolian humor that hinted at humble beginnings. Like his father before him, some of the songs that George Formby jr. performed on stage were full of double entendre. But that’s British humor for you. They like their shows to include bawdy music hall jibber-jabber, knee-slapping goofy hi-jinks, and I like it too. 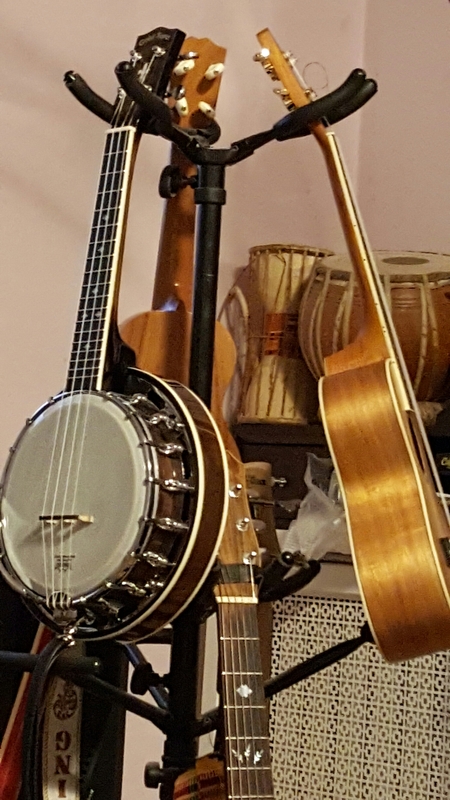 My husband asked for a Banjo Uke on his Amazon wish list, and I got him one as a surprise. Here is a video of us with his new banjo ukulele demonstrating the difference between the Hawaiian ukulele and the banjo ukulele. And here is the great George Formby Jr. Playing one of his signature humorous songs. I like George Formby’s lighthearted style and it really helped lift up Britain during the darkest days of World War II. During our cold Minnesota winters, I enjoy listening to George Formby on Google Play while I relax and wait for Spring!